Dark Legacy Comics Forums • View topic - Guild Achievements! It took longer than it should have, but we finally managed to find (and kill) an 85 Dwarven Warlock. Earning the Alliance Slayer achievement, I made haste to get to Orgrimmar and buy my new pet. He comes with a banner, yielding your guild crest. Pretty cool, IMO! Not only that, but he is also a vendor. Not just any vendor, either. He is a guild vendor! 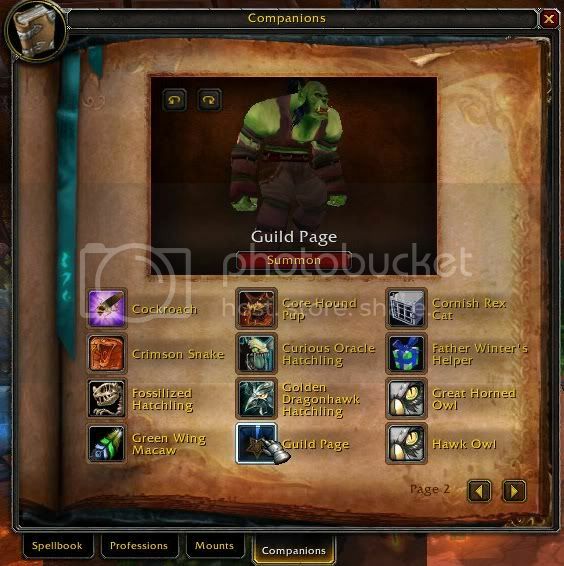 So you are able to purchase guild rewards from him. Wtf. Eight hour CD and he only lasts 5 minutes? If I wanted my ex as a non-combat pet, he wouldn't be my ex, now would he?! I think it's funny that my full grown man pet sells me more full grown men. When we're bored in my guild we group up and go kill critters. It's fun and productive at the same time! Uzrg wrote: When we're bored in my guild we group up and go kill critters. FYI, while you are in raid group and all in the same zone, each person will get credit towards the guild achievement for each single critter killed. Example: 40 man raid in any zone, one member kills a rat = BAM! 40 kill credits. Hurry before this gets hotfixed! Oooohh.. I will definately inform my guildies about this, thanks for the heads up! Last edited by Rales on Wed Jan 05, 2011 6:34 am, edited 1 time in total. For New Year's, my guild and I had a group of 10 or so running up and down the nerubian tunnel in EPL for about 3 hours to get critter kill squad. We had a demo warlock just running around hellfiring the whole place while a resto druid healed him, and then myself and a few others would dip into the side tunnels and kill off the side critters. |D Easily the most fun we'd had in a while. Raptorbane wrote: For New Year's, my guild and I had a group of 10 or so running up and down the nerubian tunnel in EPL for about 3 hours to get critter kill squad. We had a demo warlock just running around hellfiring the whole place while a resto druid healed him, and then myself and a few others would dip into the side tunnels and kill off the side critters. |D Easily the most fun we'd had in a while. I GUESS IT'LL BE A PRODUCTIVE YEAR HUH. Uzrg wrote: I GUESS IT'LL BE A PRODUCTIVE YEAR HUH. Your avatar forces me to read all your posts with a herpderp voice and therefor view you as less of a person. Your Cthulu signature forces me to read your posts as a worshiper of Ctuhlu and makes me view you as less of a lower life-form. Hey man, I been talkin' to Uzrg before he even got postin' access here. He's cool in my book. This is a very thin book, now that I look at it. Your lack of avatar forces me to read all your posts with a bland, uninterested voice, therefore i view you as a boring sort of person.